In 1883, Pastor T.S. Howell from Bunker Hill Church in rural Marion County, and six local believers met at the courthouse to organize a Baptist church within the city limits of Columbia. Early meetings were held in the courthouse, the Masonic Hall, and the Methodist Church. 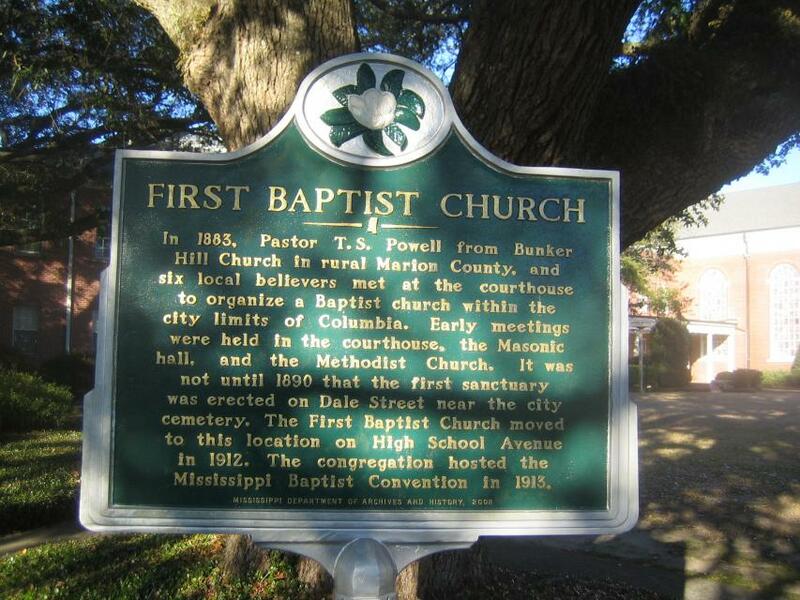 It was not until 1890 that the first sanctuary was erected on Dale St near the city cemetery. The First Baptist Church moved to this location on High School Ave in 1912. The Congregation hosted The Mississippi Baptist Convention in 1913. This marker can also be identified by its HM code. You can use the hashtag #HMXUD in tweets, and any other place where you might refer to this marker, including when searching on this site.